In the bowl of a stand mixer fitted with the paddle, beat the sugar with the butter at medium speed until light and fluffy, about 2 minutes. Beat in the egg and vanilla until incorporated, about 2 minutes. At low speed, beat in the dry ingredients until the dough just comes together. Gather and pat the dough into a 7-inch disk. Wrap in plastic and refrigerate for 1 hour. Preheat the oven to 375°. Spread the coconut in a pie plate and toast for about 10 minutes, until golden. Let cool. Line an inverted baking sheet or a pizza tray with parchment paper. Transfer the dough to the baking sheet. Bake in the center of the oven for 30 minutes, until golden around the edge. Transfer to a wire rack to cool completely. Meanwhile, preheat the broiler. 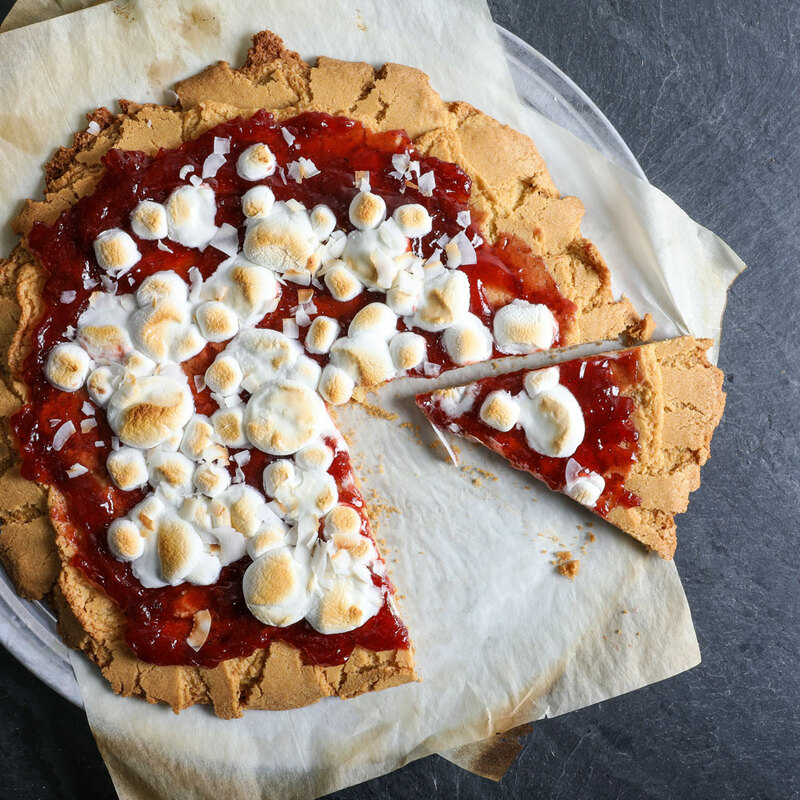 Spread the strawberry jam over the cookie crust leaving a 1-inch border around the edge. Arrange the marshmallows over the jam. Broil 5 to 6 inches from the heat, until the marshmallows are golden. Scatter the toasted coconut over the pizza, slice into wedges and serve. The cookie dough can be frozen for up to 1 month. Review Body: I really did enjoyed this! Looks like a pizza but tastes like a cookie! Review Body: Sugar + pizza = not my thing. Review Body: I will definitely try this at home as a fun dessert for my family.